Current policies designed to safeguard Mars against biological contamination from Earth are hampering exploration of the Red Planet and should be relaxed, some scientists say. These "planetary protection" requirements impose heavy financial burdens on Mars missions, partially explaining why no robots have searched for life on the Red Planet's surface since NASA's twin Viking landers ceased operations three decades ago, researchers Alberto Fairen of Cornell University and Dirk Schulze-Makuch of Washington State University write in a commentary published online today (June 27) in the journal Nature Geoscience. "If Earth micro-organisms can thrive on Mars, they almost certainly already do; and if they cannot, the transfer of Earth life to Mars should be of no concern, as it would simply not survive," Fairen and Schulze-Makuch write in the commentary. 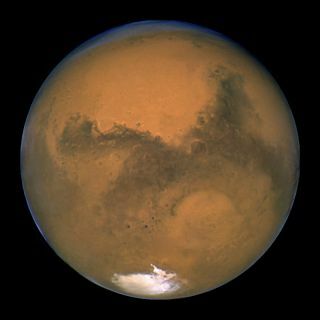 "We cannot see how our current program of Mars exploration might pose any real threat to a possible Martian biosphere." NASA and other space agencies abide by planetary protection guidelines when drawing up missions to solar system bodies such as planets, moons, comets and asteroids. Such rigorous spacecraft cleaning is time-consuming and expensive, especially for missions that aim to search for signs of life on Mars. For instance, sterilization procedures accounted for more than 10 percent of the Viking mission's overall $1 billion budget, Schulze-Makuch said. The Viking figures are in 1970s-era dollars. The costs would be even higher today for missions to Martian locales thought to be capable of supporting microbial life ("special regions" in planetary protection parlance). "Bottom line is that a thorough cleaning of a spacecraft aimed to in situ search for life on a special region of Mars today would easily cost around $500 million," Schulze-Makuch told SPACE.com via email. Sterilization should be waived for Mars orbiters and surface craft on geological missions, they say. Life-hunting landers and rovers should still be cleaned, but only to make it easier to determine if the microbes they spot are native to Mars (as opposed to hitchhikers from Earth). The protocols for such missions should be evaluated on a case-by-case basis. Fairen and Schulze-Makuch don't expect their opinion piece to spur immediate and drastic policy changes, but they do hope it stimulates discussion about Mars exploration and planetary protection requirements. "Changes in space policies and regulations are made slowly and with the greatest possible consensus, and that's good," Fairen told SPACE.com via email. "We simply thought this is an interesting debate and this was a good moment to open it."